Not all weed is created equal. Some members of the Cannabis genus pump out tetrahydrocannabinol (aka THC, the plant's main psychoactive chemical) like nobody's business, while others produce very little of the mind-altering molecule. But the genetic basis for why some plants excel at getting you high while others are best suited for, say, their use in textiles has long been a mystery. Until now. 2011 has been a good year for pot research. 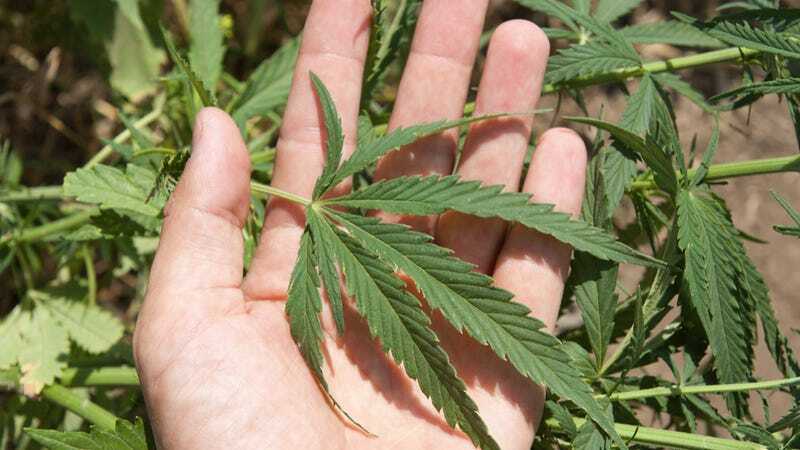 Back in August, a company by the name of Medicinal Genomics released the first complete sequence of the Cannabis sativa genome to the public, making it the first medicinal plant ever sequenced. But they only released the raw sequence, meaning the genetic data had yet to be assembled into meaningful chunks of genetic code. But today, a team of Canadian scientists led by researchers Jon Page and Tim Hughes has published a revised draft genome that is composed of much more coherent genetic information. The team used this data to compare the gene expression of Purple Kush (a particularly potent strain of marijuana) against that of "Finola" hemp, a cultivar of cannabis commonly used in the production of hempseed oil and fabrics. According to Page, "The transcriptome analysis showed that the THCA synthase gene [tetrahydrocannabinolic acid synthase], an essential enzyme in the THCA production, is turned on in [the Purple Kush], but switched off in hemp." Detailed analysis of the two genomes suggests that domestication, cultivation, and breeding of marijuana strains has caused the loss of the enzyme...which would otherwise compete for the metabolites used as starting material in THCA production. In other words, while both of the cannabis strains contain the genetic information necessary for producing THCA synthase (a key enzyme necessary for THC's production), the enzyme was only found to be abundant in the Purple Kush, and transcripts of THCA synthase were barely even detectable in the hemp strain. What's more, further experimentation revealed that an enzyme responsible for removing starting materials necessary for THC production was highly expressed in the hemp strain, but not the Purple Kush. Plants continue to be a major source of medicines, both as herbal drugs and as pharmaceutical compounds. Although more than twenty plant genomes have been published, ranging from major food crops such as rice and corn, to laboratory models like Arabidopsis, this is the first genome of a medicinal plant. Decoding the cannabis genome will help answer basic questions about the biology of Cannabis sativa and further the development of its myriad applications including strains for pharmaceutical production, and hemp plants with improved productivity and fatty acid profiles.